The Pool Trust House - especially designed and thoughtfully outfitted to create memorable moments. A high quality 5BR / 4BTH house created for discerning guests. Cook up casual meals on the Weber gas grill, while overlooking the professionally landscaped tropical backyard. Enjoy delightful views of the pool. Huddle around the fire pit situated under the lighted pergola. Choose to eat or relax in one of a variety of enticing spots: settle on the back deck, under the ceiling fan in the screened porch, or rock on the front porch. Eat inside at the family sized zinc table, sit up at the eating bar, or ease into a leather sofa in the comfortable family room. Home chefs will be thrilled to prepare meals in the well stocked kitchen of updated stainless appliances. The gas range is an extra plus. Everyone likes the open floor plan and not being closed away from the action. This is a home designed and outfitted for the comfort of your group...watch the HDTV Satellite channels on the large family room flatscreen, or retreat to individual privacy and enjoy a favorite show on an HDTV in each bedroom. Select this great location to hop quickly to downtown, or to a local wedding or event ! Or just hang around the house and enjoy the space. Live Charleston Lowcountry lifestyle in this Marsh laced Historic neighborhood. All One Level - some Steps up to front door, or down the back to the pool. This special house even has Dual Oversized Luxury King Master Suites - Families and groups adore choosing between two Masters! ...and, the icing on the cake is the 4 nice Bathrooms ! No juggling for your turn to get ready! Mirrors abound for easy dressing preparation and there is plenty of hot water for a larger group. Just 3 fast miles over the bridge into Historic Charleston, or just 6 direct miles to the closest Beach! - Outdoor Decks in front and back of house. - Kayaking, Fishing, and Crabbing on our public Waterfront Docks. - Boat launch in neighborhood. - Mosquito Treatment Yard Service. - Kitchen open concept to a large dining table for group meals. - Hardwood cypress floors through most rooms. - Family room with lots of seating and a large HDTV over the fireplace. - Satellite HDTV flat screen in every room. - Fully equipped open style kitchen. Stainless appliances. Gas range. - Granite countertops / Counter seating. - Key location at bridge for easy access to Historic Downtown Charleston. WE ACCEPT DOGS. We do charge an EXTRA FEE for each Dog! Well-behaved non-shedding housebroken CRATE TRAINED dogs can join your group for a fee. Dog Must be crated if left alone in house. Yard is fenced. "We are a neighbor friendly home rental"
- NO Stag or Bachelor groups. - NO Child student groups. - No Spring Break gangs. NO EVENTS at this property! This house is for your group only. No Gatherings of People Staying elsewhere. LOCATION - LOCATION - LOCATION. Nearly at the foot of the Ravenel Bridge over to Charleston Downtown Historic District and the Visitor Center. Local beaches only down the road 6 miles, and walking distance to famous planned I'on neighborhood. Convenient to nearly all Wedding Venues. The house is in Scanlonville / Remley's Point on a quiet dead end street. This is a very old Historic neighborhood - demographically and ethnically diverse and deeply rooted in the Gullah-Geechie culture.... settled after the Civil War. If you are uncomfortable with diversity, then you don't want to rent here. Our 5th Avenue was a prime stop on the famous Chitlin Circuit. Local homes can be moderate houses, or Mega Million dollar mansions. We have it all ! This neighborhood is laced with marshes, tidal creeks, and deep water, plus sunset views of the Charleston Ravenel Bridge. There are 3 public waterfront docks close by. Sit under the fans on the back screened porch. Have your pick of the Dual Master King Suites opening to the decks, and overlooking the yard and pool. There are sets of seating all around the porches, decks, and screened porch… chair groupings, rocking chairs, gliders, tables. * King Master Suite Bedroom #1- Master Suite with a King Bed. ( Plus a small Click-clack couch bed and 2 stored Twin Beds in closet). French Doors open to deck and pool. Australian Hardwood Floors. Attached private huge luxury bathroom. Ceiling fan and large HDTV. * King Master Suite Bedroom #2 – Across the hall, is a second Master Suite with a King Bed. ( Plus a Queen Sofabed and SmallStorage Bench Cot). French Doors open to deck and pool. Australian Hardwood Floors. Attached private luxury bathroom. Ceiling fan and large HDTV. * Queen Bedroom #3– Queen 4-post bed, and private attached tiled bathroom. Ceiling fan and HDTV. * Queen Bedroom #4– Queen solid Wood Bed. This bedroom shares the 4th bathroom. Ceiling fan and HDTV. * Queen Bedroom #5– Queen blonde Wood Bed. This bedroom shares the 4th bathroom. Ceiling fan and HDTV. * Two High Quality Twin Mattresses and Folding Metal Bed Support Frames - Stored in Master closet. Guest can set them up if needed and placed wherever you prefer them. * Click Clack Small Futon Bed – Located in the sitting area of the 1st Master Suite. * Pull Out Queen Sofa Bed – Located in the sitting area of the 2nd Master Suite. * Pull out Small Storage Bench Cot – Located in the sitting area of the 2nd Master Suite. * Master Private Bathroom #1 - Private and attached to the 1st Master King Suite. Glass and tile shower, separate deep tub, double vanity, and Water Closet with toilet. * Master Private Bathroom # 2 Private and attached to the 2nd Master King Suite. Beautiful tiled walk-in shower with a bench and glass doors, a single vanity, and toilet. * Private Bathroom #3 Private and attached to a Queen Bedroom. Vanity, combination tub/shower, and toilet. * Bathroom #4 Shared by 2 Queen rooms. Vanity, combination tub/shower, and toilet. * Family Room - Oversized HDTV, satellite, stereo, fireplace, chairs, 2 leather sofas, ceiling fan. Room is open to the dining area, and to the kitchen. Cypress Hardwood floors and area rugs. * Kitchen - Fully equipped and updated. Granite Countertops. Gas range. Oven. Large stainless refrigerator. Dishwasher. Garbage disposal. Coffee pot, toaster oven, all appliances. Basic spices, pots and pans, cutlery. Nicely stocked. Open pass through to dining room and adjacent to family room. Counter stools for eating at the granite countertop. * Dining Room - Large stunning zinc table. Seats 10 and can squeeze in 12. Open to the family room and to the kitchen. * Screened Porch -Group gathering space with table and chairs. Ceiling Fan. * Washer and Dryer Separate utility room off the hallway. Large quality machines. ***** We have a 2nd rental ...just 3.5 blocks away. The Big Chill on the Waterfront! Laurie is proud to be involved in local town politics and works to ensure the rental properties are Legal and approved by the town. Laurie sits on the Accommodations and Tax Committee for the Town of Mount Pleasant to dispense tax funds. She is also proud to have been chosen to be involved actively with HomeAway/ VRBO on the Owner's Advisory Council. In February of 2017, Laurie won a National Contest based upon Marketing the Rental by showcasing improvements in Rental Properties. Laurie is a part time travel specialist for All inclusive resorts, International Travel, European River Cruises, and Cruise Ships. Laurie brings professional hospitality flair into the rental properties. Laurie happily lives in a property in this neighborhood, just a few blocks away, with her husband, George. About George: After a high powered corporate career, and then owning a successful retail chain, George now is thrilled to welcome guests to our Charleston rentals. George ensures that your visit is comfortable and smooth. He oversees the maintenance and improvements of the houses, and keeps the grounds manicured. George takes pride in seeing that your rental meets, or exceeds, your expectations. You will find George out on his boat in the waterways of the neighborhood, or walking our Pomeranian dog, Gus. We love Charleston and have lived here nearly 25 years. As the town grew, we chose to be close to downtown, and settled in this unique and changing neighborhood of Remleys Point. We feel grateful to have more than one house to share for others who wish to visit the great LowCountry area, or are here with family or friends. We love this large one level house with lots of bathrooms and close to downtown and the beaches. We have lived in this neighborhood ourselves for 18 years! ...and when the opportunity came available to own a 2nd home also....we were thrilled. We have enjoyed improving the property, and decorating and landscaping it, and offering it now as a family style rental. This eclectic and interesting neighborhood and its waterfront docks, plus the closeness to Historic downtown Charleston and the Beach, makes this a perfect base for visitors. For any groups in town for a wedding, or an event, or just a vacation .....this is a great spot. The in ground pool is a wonderful addition for visitors during warmer months. toilet, tub, shower, outdoor shower, Tile and Glass. Double Vanity. Soaking Tub. Toilet Closet. toilet, shower, Tile and Glass Walk in Shower with Bench and grab bar. The Two Master Bathrooms are both over the top very wonderful....and savvy. The other bathrooms are very nice and come with tub / shower combos and mosaic flooring, or tile and marble walk -in showers. Sullivans Island is a few miles down the road. Car needed you will have to drive there. Pool in backyard. Walk around neighborhood for marsh, river, creek, and water views. The house is not Waterfront but the neighborhood is, and you have access to the docks at no cost, and the boat launch. 2 full house zoned Central HVAC systems. One runs the front zone of the house and the other runs the back bedrooms. Comfortable quality linens. Duvet bedding. Wireless. Password given upon arrival. Two leather couches, two leather chairs, two swivel chairs, large HDTV, satellite with premium channels. Gas Range / not electric. Stainless. Basic Spices and Starter items. 7 foot zinc dining table with plenty of extra chairs. Also outdoor tables....one in screened porch, one under pergola, and one on deck. One player in drawer for use on any tv. We do not provide Kayaks, but they can be brought with you, or rented locally, and launched from the neighborhood boat landings. Boat launch is at end of neighborhood. Bring your own boat. We dont provide a boat. Three decks areas. One in front with rocking chairs, and two in back overlooking the yard and pool. The back deck has a large outdoor dining table, on one side, and glider bench on the other side. Golf nearby - Patriots Point and many other courses. 30 foot eco-friendly pool in backyard with furniture and pergola. Full Sun. Waterfront neighborhood perfect for kayaking, fishing, crabbing, Stand up paddle boarding. Rentals are nearby for kayaks and paddleboards and bicycles. Extremely nice, clean, well equipped. Highly recommend. We stayed for six nights for my son’s wedding nearby. The home is awesome, clean and beautiful. Laurie is the perfect host and was very helpful before and during our stay. Very happy with our stay. We have been coming to Charleston for 5 years and this is absolutely the best home we have ever rented. Stayed 4 nights with family during our visit back to Charleston for our wedding reception. The house was perfectly located with very easy access to the bridge and downtown, the Shem Creek area and the rest of Mount Pleasant. Also with numerous grocery stores and other practical amenities nearby. The house was spacious, clean and well-appointed and easily accommodated 9 adults. Owners were very attentive. Would definitely stay again if travelling with a large group. 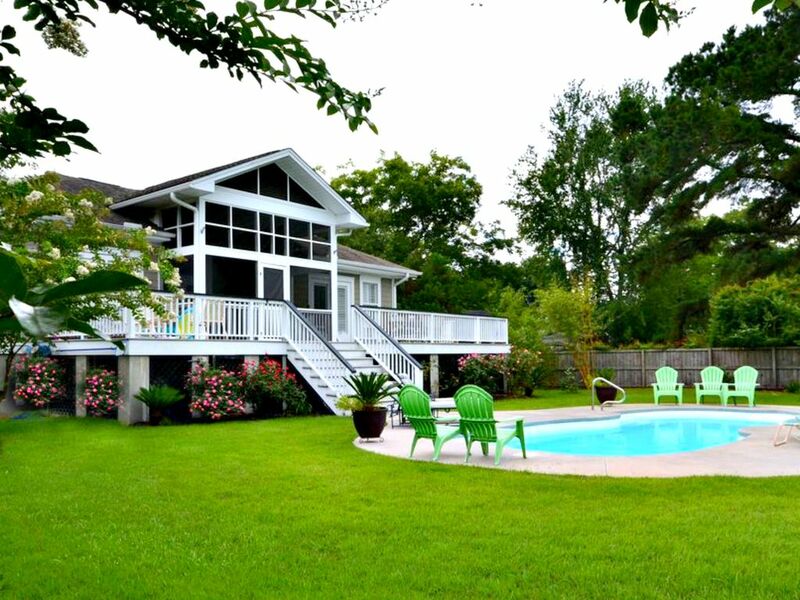 Such a great property and so close to Charleston! I adored this property! We were traveling to Charleston for a long weekend with a good size family. This is right over the bridge maybe 5-10 minutes away from downtown Charleston. It is easy to find, in a good neighborhood and the house is perfect! The bedrooms are all good sizes and even has 2 master bedrooms with huge bathrooms! They have extra mattress', a futon and a couple of other pieces of furniture that pull out into beds which makes this a great place for our family. Laurie and George we super kind through all of this and very helpful. I would definitely go back if I was in the area. The outside is amazing as well, while it was too cold to swim, we did enjoy the firepit close by. It was nice to even just sit at the pool and admire the pretty backyard. The house is super clean and furnished with most everything you need. I loved this place so much! Perfect home for our reunion! We were five couples and the house was very clean, spacious, and comfortable for our weeklong stay. If the weather had been a little warmer, we would have taken more advantage of the pool and outdoor space. The location was perfect for all the activities we did, and getting into Charleston was a breeze. Laurie and George were very responsive and their recommendations for restaurants in the area were spot on. We loved our stay and have already recommended this house to another set of friends who are also planning a trip to the Charleston area. We stayed here for a family weds and decided to make a week of it with the entire family. Accommodations were perfect for everyone. Location was in perfect proximity to Charleston and Sullivan’s Island. Hope mom will take us back. We all felt at home. Thanks George!! The Location is close to most wedding venues: I'on Creek Club, Lowndes Grove Plantation, Boone Hall Plantation, William Aiken House, Cottage on the Creek, and much more. Be near Patriots Point,and also Shem Creek. Be in the center of it all. A REFUNDABLE SECURITY DEPOSIT IS REQUIRED, BUT NOT INCLUDED IN QUOTE. REFUNDABLE SECURITY DEPOSIT IS PAID BY CHECK DIRECTLY TO OWNER 1) Pets are an extra fee. Must be crate trained and pre-approved. 2) No stag groups 3) This is not a "party house". 4) I would be please to set up a 3 payment plan. 5) Valid picture ID required with reservation.